Enjoy Utah! : Meteor Shower TONIGHT! Apparently there is a meteor shower tonight! I would have posted this sooner but I JUST found out about it! Halley's Comet won't zoom near Earth again for another 50 years, but the ice ball may still put on a show for some skywatchers this week in the form of a meteor shower. 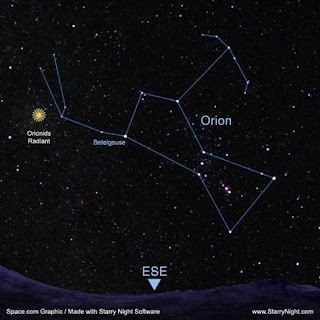 This year's October shower — called the Orionid meteor shower, because it appears to come from the constellation Orion — has been going on since Oct. 15, according to NASA officials. It will peak today (Oct. 21).